Over the past few years I’ve noticed there’s a lone female scaup that sometimes hangs out at Horse Lake. I don’t know if it’s the same bird from year to year, and she often hangs out at the far side of the lake, but it’s always a treat when she swims in close. Unfortunately in this instance I had been photographing diving coots and ducks and to get a high shutter speed was shooting at ISO 3200. That’s higher than I like to push the 7D and the technical quality of the picture suffers a bit for it, but since she was yawning it provides a nice change from my other pictures of her. 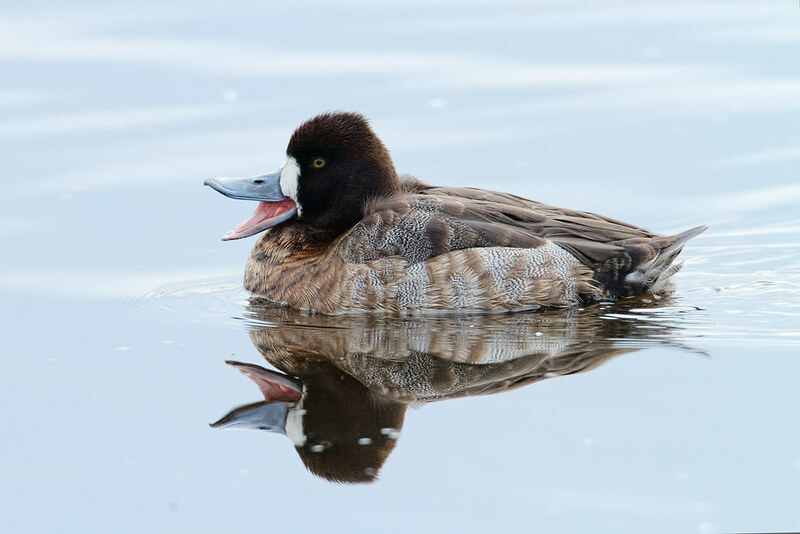 This entry was posted in Birds and tagged auto tour, Horse Lake, lesser scaup, Ridgefield National Wildlife Refuge, River S Unit, swimming, Washington, yawning. Bookmark the permalink.